The part of the teeth lying above the gum is known as the natural tooth crown. If the natural tooth crown has received such damage that it can no longer be treated with a filling, an artificial crown is created so that the natural tooth can be retained. 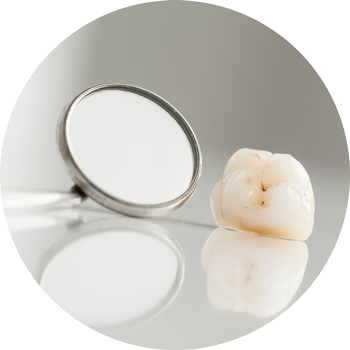 A crown is also used when the natural tooth can no longer be saved and the tooth is replaced by an implant. In this case the crown serves as a mounting, which replaces the missing tooth on the artificial root (implant). Just like the bridge, the crown is a fixed dental prosthesis and offers the advantage of being close to the original, natural dentition. This also means that a crown allows almost complete recreation of the normal chewing and speaking functions. There are various materials which can be used to produce crowns. There are for example metal crowns, made from gold, titanium or steel. Metal crowns are, however, not aesthetic. It is possible to produce a faced crown, a metal scaffold covered by ceramic, in order to achieve an aesthetic result with a metal base crown. Another crown variation which is predominantly used today is the porcelain jacket. It is characterised by its high stability, durability and aesthetics. Furthermore, porcelain jacket crowns are biocompatible and therefore suitable for allergy sufferers. Every crown is a work of precision. Therefore, we work exclusively with dental laboratories that are recognised for their exceptional quality and high reliability, as well as offering a guarantee of several years on their work. We work primarily with local Swiss laboratories. The advantage of Swiss laboratories is the faster processing of the dental prosthetic work as well as the better range of services. Our dentists are happy to advise you when selecting the best laboratory for you.